Anxiety and fear are often considered to be synonymous. While we might substitute one for the other, both are different terms from psychological perspective. Fear is a worry about something in our immediate environment or future, while anxiety is a condition when an individual worries extremely and constantly about things which might or might not occur in future. So, when you face a lion in a forest, you are overcome with fear, and you take immediate steps like running or hiding to protect yourself. Whereas, when you worry every morning about your work appraisal, and panic at every office situation, you are suffering from anxiety. How can you identify anxiety? Constant and obsessive thoughts of future and circumstances beyond control. Frequent headaches, heart palpitations, sweaty limbs and insomnia. Upset stomach, dehydration and diarrhoea. The person might be phobic and fear intensely and unrealistically a particular situation or object that might actually not be dangerous at all. He is irritable and unable to be calm. Feels tensed and jumpy at minor issues. Has constant nightmares and flashbacks to traumatic events. 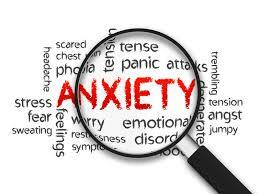 When an individual shows many or all of these symptoms most of the time, he is said to suffer from anxiety disorders. While the causes of anxiety are manifold, like genetics, home environment, childhood traumas, chemical imbalance in the brain etc. ., it is sometimes believed that the living conditions and lifestyle evolved much faster than our brains. The human brain was designed to conquer immediate fears, like the fear of survival and food, and with the changing lifestyles man was not able to cope with his fears. In today’s times a man worries for his job, his relationships, also his health, all of which do not have immediate outcomes. Anxiety manifests itself most usually between 20-30 years of age in a person, and might get aggravated after the age of 40. When in small doses, anxiety makes the individual proactive and think of ways to overcome his situation. The person suffering from anxiety is not able to perform everyday functions normally due to being tensed all the time. His work, relationships and social life begin suffer and he feels socially isolated. When left untreated for long, anxiety leads to other conditions such as depression, bipolar disorder, substance abuse, eating disorders and schizophrenia. A distressed mind causes adverse effects on the body, making it more susceptible to respiratory, heart and gastric ailments. While the statistics are disheartening, help is always available for managing and treating anxiety through medication, psychotherapy, and proper awareness, and it is possible for the individual to lead a healthy and happy life. Doubtlessly, as you grow older, you regularly lose a few of the brain’s ..
What was a term limited to mostly the busiest and most stressed people .. Constant worry over or a nagging fear of the unknown is psychologically termed ..
Understanding the social interaction is one of the biggest challenges in life. Many ..
Back- to- work is a one of a kind program that helps people ..
Post-traumatic stress disorder or PTSD is a manifestation of symptoms that cause distress .. Someone who has moved overseas will definitely understand that there are many issues ..